SUMMARY: We report a case of a giant serpentine aneurysm (GSA) of the middle cerebral artery (MCA) that underwent complete spontaneous thrombosis after angiography. The patient was a 24-year-old man who had an acute headache. CT and MR examinations revealed a large partially thrombosed aneurysm of the MCA with residual flow in the artery. Angiography demonstrated a GSA arising from the left MCA. Thirteen days later, a second angiography showed complete thrombosis of the aneurysm. Giant serpentine aneurysms (GSA) are partially thrombosed aneurysms containing tortuous vascular channels. 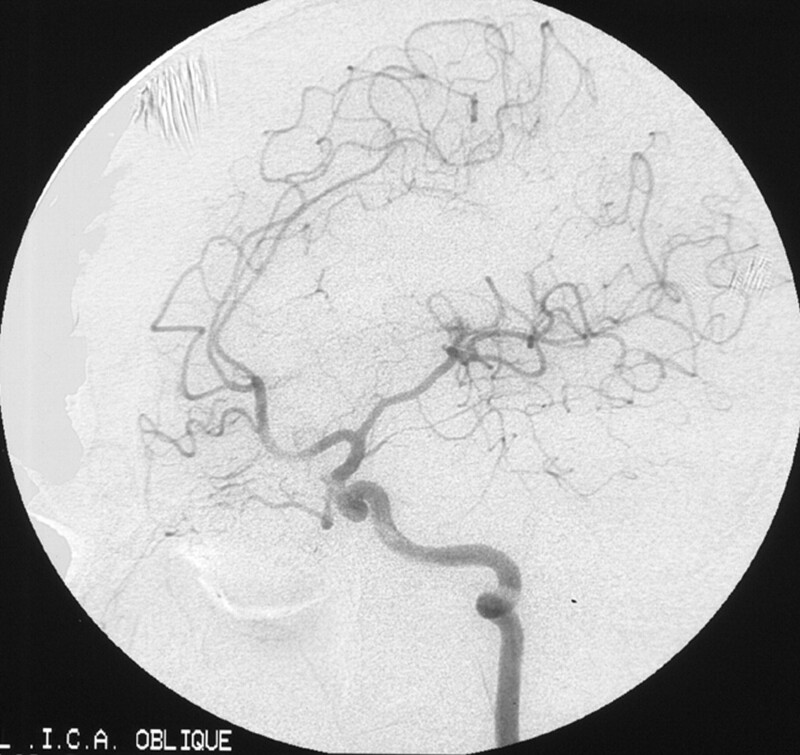 The first literature review of this entity was published by Segal and McLaurin in 1977.1 In this report, we describe a large serpentine aneurysm that showed acute complete thrombosis 13 days after the first diagnostic angiography. A 24-year-old man was admitted to the emergency department with acute headaches. Physical examination revealed no focal neurologic deficits. MR revealed a large right frontotemporal mass, approximately 5.0 × 6.0 × 5.5 cm, of complex signal intensity on both T1- and T2-weighted images representing variable degrees of hemoglobin degradation products (Fig 1). T1-weighted image showed an ectatic vascular channel that enhanced with contrast medium (Fig 1A), and the T2-weighted image showed hyperintense tubular structure with a ghost artifact secondary to blood flow (Fig 1B). 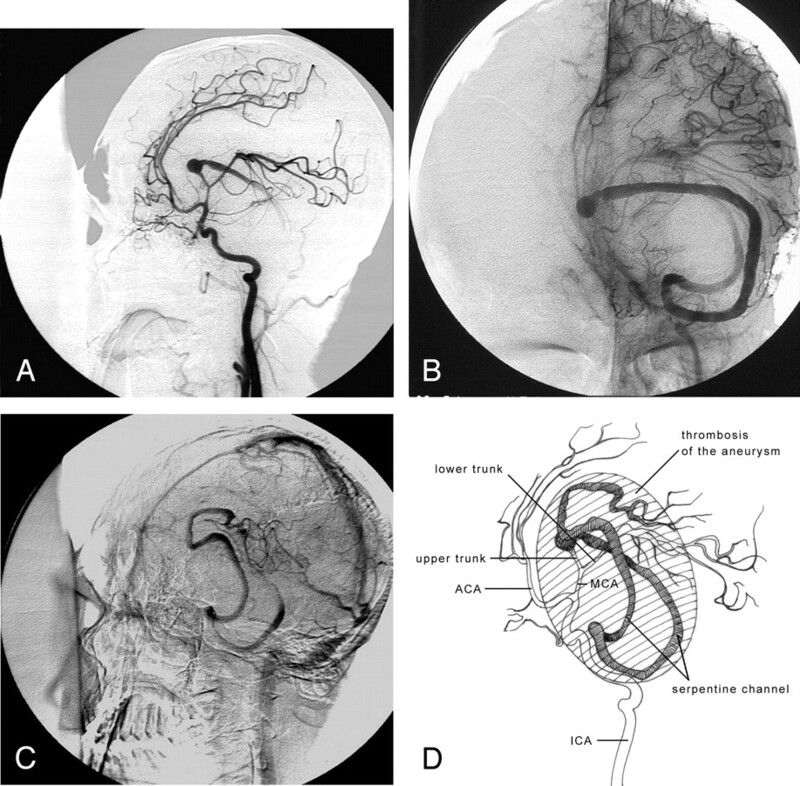 The cerebral angiography performed the next day demonstrated a tortuous enlargement vascular channel arising from the upper trunk of the left middle cerebral artery (MCA). The serpiginous lumen filled extremely slowly and supplied blood to upper trunk of the left MCA branches arising from the upper aspect of the aneurysm (Fig 2). In addition, the anterior cerebral artery and MCA were displaced medially by the aneurysm. Thirteen days later, the patient was referred to the angiographic unit for endovascular treatment of the aneurysm. The angiography showed complete occlusion of the serpentine channel seen in the previous angiography (Fig 3). After spontaneous thrombosis of the aneurysm, the upper trunk of MCA distal branches was filled by the collateral vessels arising from lower trunk of MCA and anterior cerebral artery branches. Radiologic follow-up 3 years later showed a persistent thrombosed aneurysm with central and peripheral calcification in the left MCA distribution compatible with chronic changes (Fig 4), and the cerebral angiography showed no abnormal vascular channel, which was seen in the first angiography, and no filling of an aneurysm (Fig 5). The patient remains clinically stable without neurologic deficit. 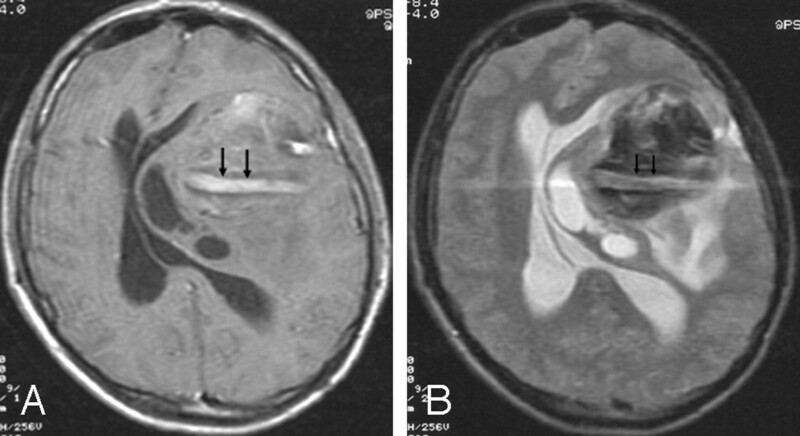 Postgadolinium T1-weighted (A) and T2-weighted (B) MR images show a large, partially thrombosed aneurysm. The aneurysm contains a persistent vascular channel, which causes a ghost artifact and enhances on the postgadolinium T1-weighted image (arrows). The vascular channel is surrounded by thrombus. Note the associated mass effect on the left lateral ventricle and midline shift. Left internal carotid artery angiogram. 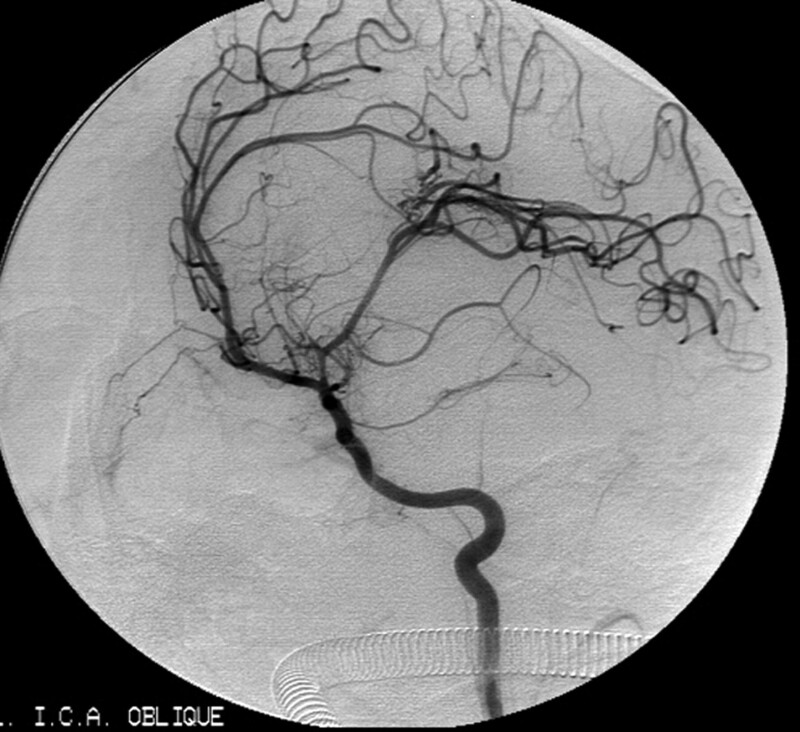 Early arterial phase oblique projection (A) shows filling of vascular channel serpentine aneurysm arising from upper trunk of the left middle cerebral artery (MCA). Midarterial phase Towne projection (B) and late-arterial-phase oblique projection (C) show the whole tortuous vascular channel of the serpentine aneurysm. Note the extremely slow flow and the filling of normal cortical branches of distal parietal arteries. Schematic drawing (D) illustrates the giant serpentine aneurysm (GSA) that corresponds to the angiograms. Repeat angiogram 13 days after the first diagnostic angiography shows the complete obliteration of the aneurysm lumen. There is also superior and medial displacement in internal carotid artery and middle cerebral artery (MCA). A, Sixteen months later, T2-weighted axial image shows a large thrombosed aneurysm in the left frontotemporal region. B, Three years later, unenhanced axial CT image shows the large mass in the left frontotemporal region, with central and peripheral calcification. Three years later, final angiogram shows no abnormal vascular channel. Giant serpentine aneurysms have been defined as giant (>2.5 cm) and are almost completely clotted except for tortuous vascular channels that have separate entrance and outflow pathways.2,3 These intrathrombotic channels are not endothelialized and do not contain normal elastic lamina or media.1,3 Pathologically, GSAs are large globoid or pear-shaped masses with a 1 - to 4-mm-thick fibrous wall that may contain numerous small vessels, deposits of hemosiderin, and calcifications.2–4 GSAs are most commonly found on the MCA or its branch vessels.3,5,6 Most patients are male, and peak age for occurrence is 30 to 60 years.5 The clinical presentations of GSAs are usually intracranial mass rather than intracranial hemorrhage.1,3,4,6 The aneurysm of our patient was approximately 5.0 × 6.0 × 5.5 cm in diameter and located in left MCA. 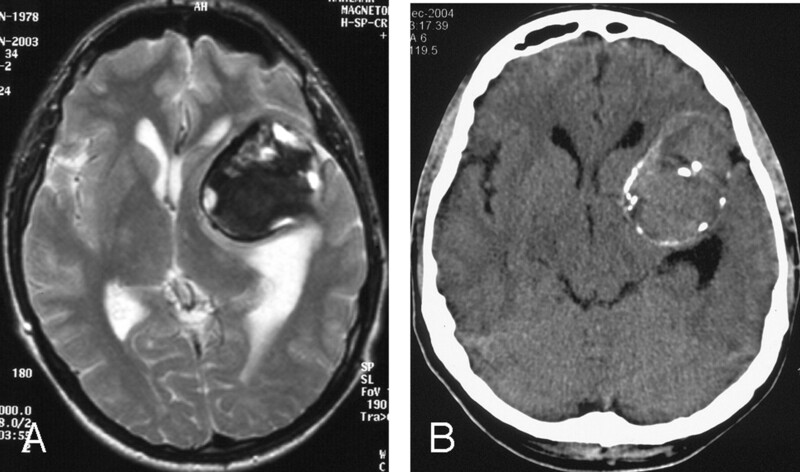 Our patient presented with signs of an intracranial mass. The precise cause of GSAs remains uncertain. Aletich et al and Tomasello et al3,7 reported a small fusiform aneurysm of a branch of the MCA that progressed to a GSA during a 5-year period, which suggests that the latter may have its origin in fusiform aneurysms that grow larger in time and undergo thrombosis and organization. In addition, Fodstad et al8 described the formation of a GSA 6 months after carotid ligation for treatment of a giant aneurysm. It has recently been hypothesized that continual growth of a dolichoectatic aneurysm may lead to the formation of a GSA.9 We cannot speculate that the cause of GSA in our patient originated from fusiform or saccular aneurysm, because we have no previous imaging studies of the case. The radiographic findings of GSAs have been well defined in the literature. In brief, conventional radiography may show pineal displacement caused by mass effect, curvilinear calcification, and erosive change involving the skull base. CT usually demonstrates hyperattenuated mass associated with various degrees of edema. The postcontrast CT scans show intense enhancement of the serpentine vascular channel within the aneurysm.3,7,9 The MR imaging findings consist of a mass lesion with a heterogeneous signal intensity that represents various stages of hemoglobin degradation products and flow void regions representing the patent channel within the aneurysm.5 The residual channel within the partially thrombosed lumen may demonstrate enhancement at MR imaging that is probably secondary to the slow flow within aneurysm, as seen in our case (Fig 1A). The angiography is pathognomonic of a GSA with a fusiform serpiginous channel, which supplies the normal distal circulation of the parent artery. There is a typically slow flow that represents a notable prolongation of circulation time (Fig 2). Spontaneous complete occlusion of a giant saccular aneurysm is a well-recognized phenomenon that can occur in 13% to 20% of cases10–12; however, spontaneous thrombosis in GSAs is extremely rare, and only one case has been reported in the literature. The reported patient had a large serpentine aneurysm in right MCA trifurcation.3 The aneurysm was completely thrombosed 5 months after the first angiography. In our patient, complete spontaneous thrombosis of the aneurysm had developed 13 days after the diagnostic angiography (Fig 3). The mechanism of spontaneous thrombosis is not clear. In our case, we can explain this phenomenon with the fact that the extremely slow flow to distal branches of the MCA and altered homodynamic factors resulted in intraluminal thrombosis. In addition, the contrast-induced thrombosis could also be considered as another possible cause of this acute thrombosis.